Manny ‘Pacman’ Pacquiao is in deep preparations for his upcoming January 19th showdown against Adrien Broner at the MGM Grand in Las Vegas. 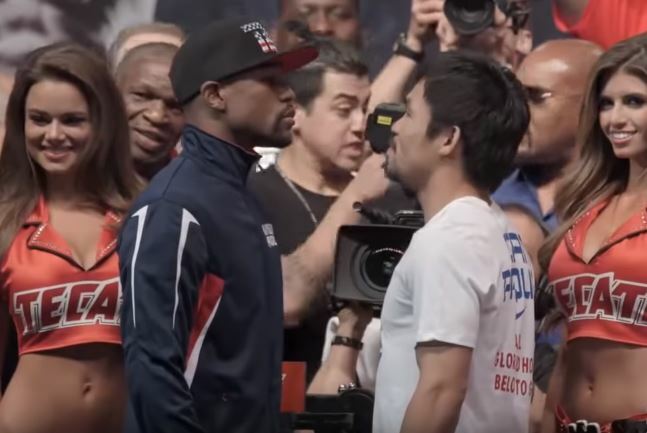 It wasn’t long ago that the world was talking about his own fight with Mayweather back in May 2015 but a lot has changed for both men and indeed the sport since then. Pacquiao now finds himself coming towards the tail end of his legendary career while Mayweather essentially has finished his for all intents and purposes — but still is selecting the odd athletic outing here and there. The latest came this weekend in Japan in the form of a three round boxing exhibition bout against a Japanese kick boxer and mixed martial arts fighter. A lot was made about that Mayweather’s opponent at the weekend was much smaller and lighter than him, as well as having no business anywhere near a ring with someone of the calibre of Mayweather. Manny Pacquiao's been fighting with a WEIGHT HANDICAP for a DECADE. Sugar Ray Robinson NEVER fought above his weight (Middleweight). Manny Pacquiao is the #GOAT objectively speaking. To equal Pac-Margarito, SRR needed to beat a 217 lbs HEAVYWEIGHT. Of course, it should also be pointed out that there are those who disagree with Manny’s sentiments above too. Ultimately, this all looks like it’s building to one thing between the two fighters later this year. A Floyd Mayweather vs Manny Pacquiao part two.